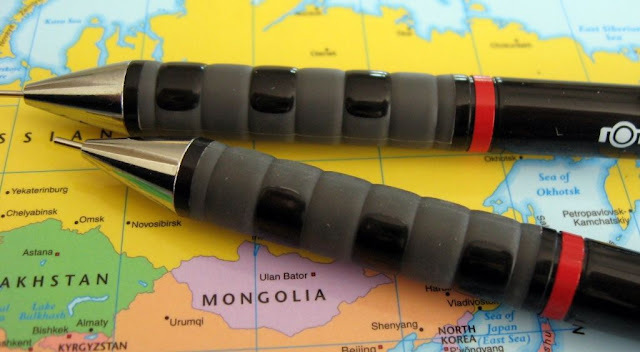 The Rotring Tikky mechanical pencil has been around for many years and undergone many changes since it was first released. I’m not a Tikky expert so I can’t detail the various changes it has undergone, but if my memory is correct I recall that the author of the now deleted Pencil Box blog stated he had something like 30 or 40 different variants of the Tikky. The latest incarnation of the Tikky mechanical pencil is significantly different from its immediate predecessor, so I’ll point out a few of the main changes below. 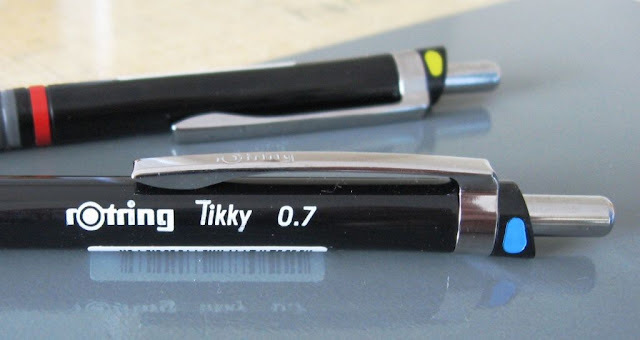 I have two older Rotring Tikky’s dating from the early to mid 2000’s. 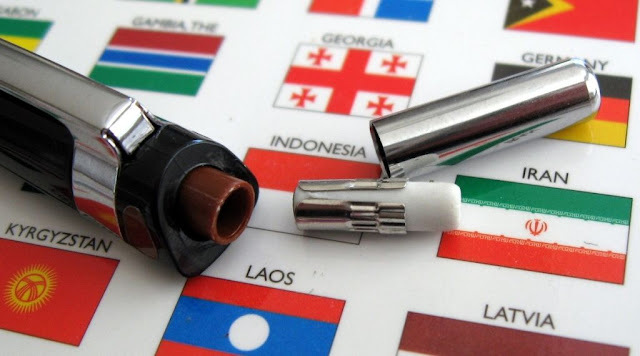 The white 0.9mm is logoed as a Rotring Tikky II (1.0mm) and the brown 0.5mm as a Rotring T. Apart from the name, there’s no obvious difference between them upon visual inspection. They are pictured below with the current Tikky. Comparing these two older Tikky’s to the current Tikky, it’s fairly obvious that the apart from the name “Tikky” and concept of the wave grip zone the current Tikky has virtually nothing in common with the old Tikky. Maybe some or all of the internal components are the same, but externally they have little in common. Different end caps. Also note the method of pocket clip attachment to the body. Different tip sections, and grips, although conceptually similar. Old Tikky has a round upper body whereas new Tikky transitions from a round lower body to a sort of rounded trapezium shape up at the end. Note the old Tikky had “Made in Germany” moulded into it. 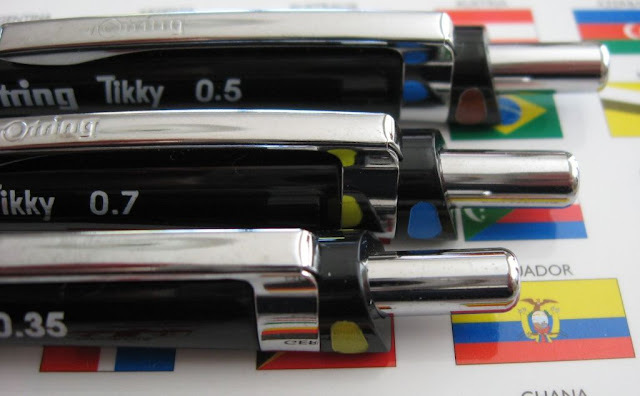 The new Tikky has no country of origin either on the pencil or the packaging. It states distributed by, but not manufactured by or in. 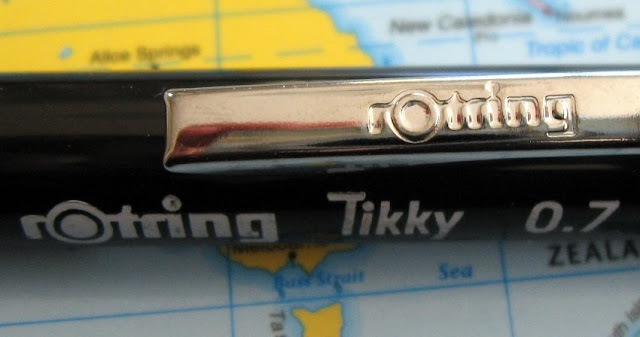 Link to Rotring Tikky mechanical pencil review. 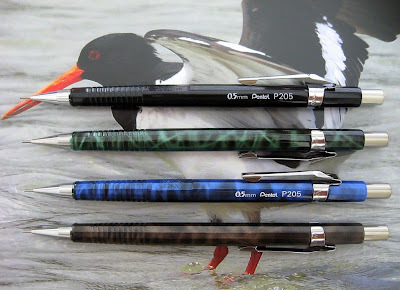 The Pentel P205M Sharp Limited Edition has been available from the Pentel USA online store for a fair while now, and a few months ago I finally weakened and handed over the dosh for some pencils. I had held off from buying them because I didn’t think I’d like their colour scheme, and now that I’ve got them, I was right. Camouflage isn’t really my sort of colour scheme. They are all a bit dull really. 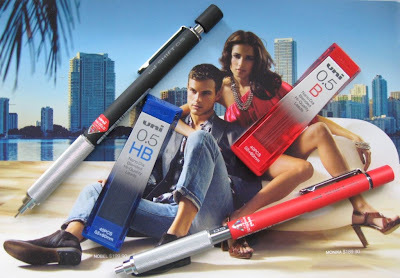 Still, if you are a Pentel person then you sort of have to get them. Shown below are the three different colours I bought, plus a standard black P205. There is also a red P205M, but I didn't purchase that one. 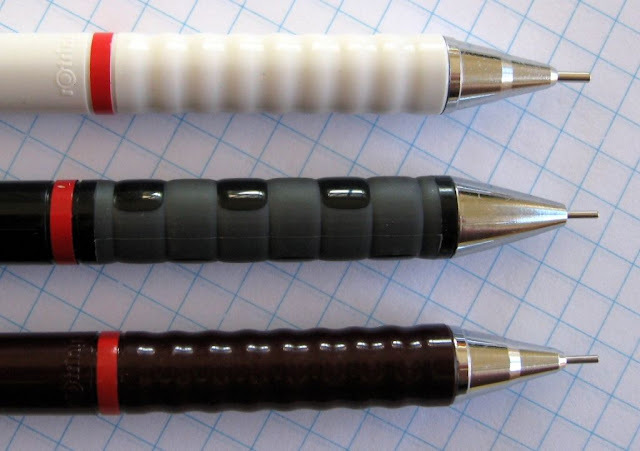 Before the internet, finding and communicating with fellow mechanical pencil collectors was a near impossible task. 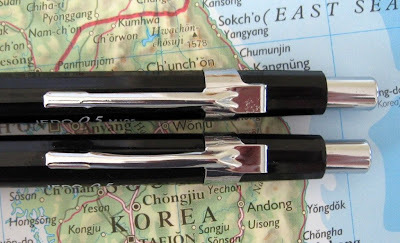 Over the course of this blog I have had the pleasure of communicating with several Korean pencil-folk. 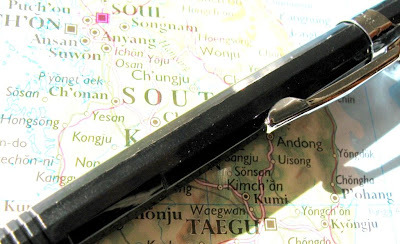 There are quite a few Korean manufacturers and brands of writing instruments, but it seems most are not generally regarded by Koreans as particularly good quality, which surprises me. I think Korean manufactured products generally have a reasonable reputation, that there is some value in “Made in Korea” Sure, it’s not “Made in Japan” or Germany, but it’s better than many. Micro was one of the larger Korean manufacturers, but they went bankrupt quite a few years ago. However their legacy continues on under the name eMicro. Recently I have been in contact with Kent from South Korea who publishes PenciLog. I asked him a few questions about eMicro, the use of the term Jedo, etc and he accepted the challenge. Putting on his Sherlock Holmes detective hat, he picked up the phone and let his fingers do the walking, making some calls to eMicro and others. The answers were limited, but interesting. 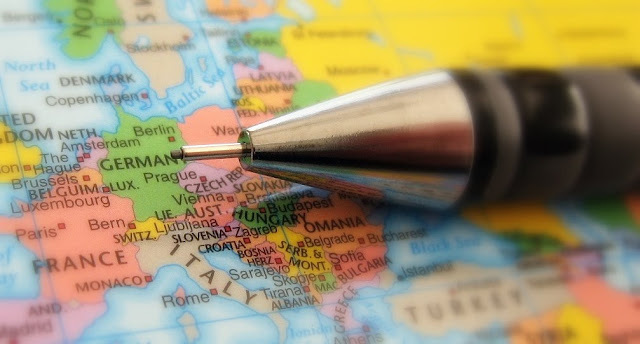 eMicro was founded by former staff of Micro, but there is no legal relationship or continuation between the two. It appears that Korean companies consider the Korean word '제도' and its pronunciation as written in English as 'Jedo' are both proper nouns and thus not copyrightable. Kind of interesting. I wonder if the Japanese consider the English wording “Sharp” (for mechanical pencil) in the same way? Well, that’s just another little snippet or two of information. 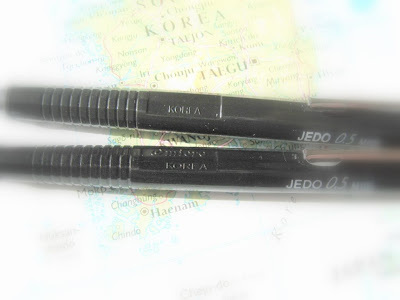 Kent also sent me an eMicro Jedo M105 mechanical pencil. I actually already had one of these, purchased a few years ago at Morning Glory. Like the other Koreans I have communicated with, Kent was at pains to point out that the M105 was not highly regarded in Korea, but was common because of its very low price and variable quality. I must admit that my original eMicro Jedo M105 mechanical pencil didn’t strike me as that bad. 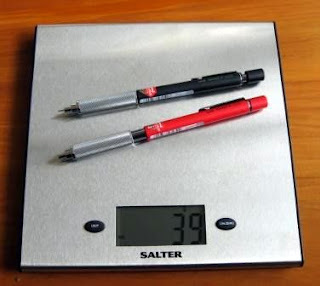 Just another Pentel P205 rip-off. Well, that’s another point. Is it a rip-off or is it a legally licensed copy? I hear both stories. Moving on, whilst my original M105 seemed reasonable enough, the more recent M105 sent by Kent is a shocker. Clearly eMicro suffer from wildly variable quality, or their quality has declined substantially over the past few years. Take a look at the pocket clip. The original has some pitting but is otherwise acceptable. But look, the recent one has a bent clip!!! Surely this would never make it out of the door at Pentel or Pilot. My camera, photographic skills and photo editing software are stretched to the limit, but note the differences in stamping in the pocket clips. And the wording moulded into the body. The real shocker though is the part line on the body of newer Jedo M105. The part line is where the two halves of the mould come together. If the two halves of the mould don’t match exactly together or if the edges are a little rounded and worn then you get a noticeable joint, a sharp little ridge of plastic, or in this case a “Yowie, almost cut my finger” type of knife edge of plastic. I’ve mucked around with the photo as much as I can to try and show the sharp part line below. It really is bad. In Japan, surely someone would lose their job over this. Just a note to finish with. Please don't think I'm picking on Korean brands or anything. 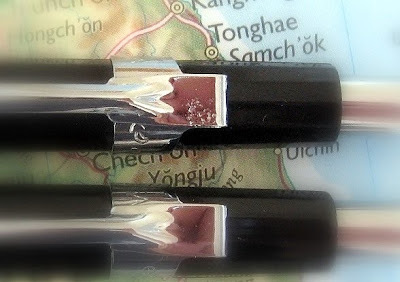 No matter how good or bad these Korean pencils are, Korea actually has a pencil industry, which is a lot more than I can say about my homeland! 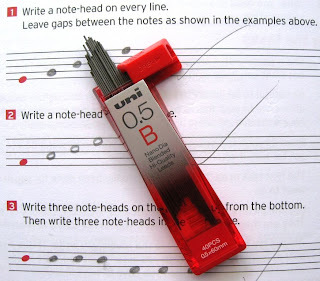 Earlier this year Japan’s Mitsubishi Pencil Company released their new mechanical pencil leads, Uni Nano Dia. 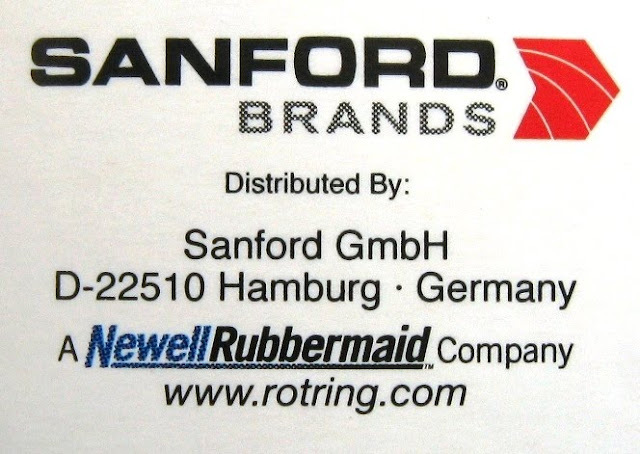 As far as I can tell, basically their claim is that by mixing super small carbon based nano-particles (so called “nano-diamonds”) into the lead formulation, that friction will be reduced thereby creating a strong uniformly dense, dark, smooth writing lead with reduced wear. Diamonds...sounds great. Well then, let’s check these Uni Nano Dia leads out. 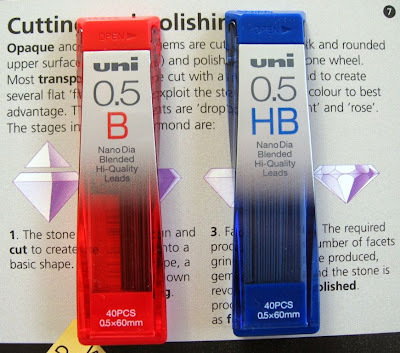 Uni Nano Dia leads come in a range of diameters and hardness grades. 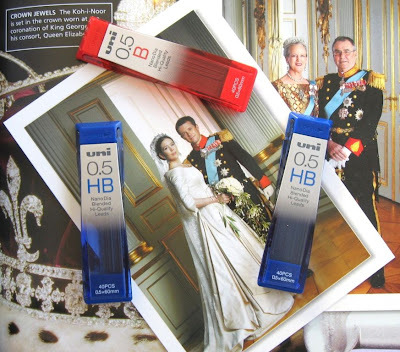 Currently in 0.5mm they come in 4H through to 4B, including F. I think they only have the one grade of HB, not the other two grades of HB that some Japanese brands offer. The lead tubes are colour coded by hardness grade in very bright attractive transparent coloured containers. There are 40 x 0.5mm leads per container. The top slides to the side to let you get the leads out. First up, lets try laying down some lead and erasing it. Below is the test card, with Ain and Nano Dia erased by Staedtler Mars Plastic, Pentel Hi-Polymer and Faber-Castell PVC Free erasers. Effectively there’s no significant difference, perhaps the slightest hint of a little smearing with Nano Dia but basically it’s a dead heat. Next then test for smearing. For some artistic purposes you might want a lead to be smearable, but for normal writing purposes I believe most of use a smear resistant lead. Again, as you can see below it is close, but I think Ain was a fraction more smear resistant. How about blackness. Well, both are quite similar in their darkness. As usual, I find there is little difference in darkness between HB and B. Personally I nearly always have to jump two or three lead grades to find a real difference. 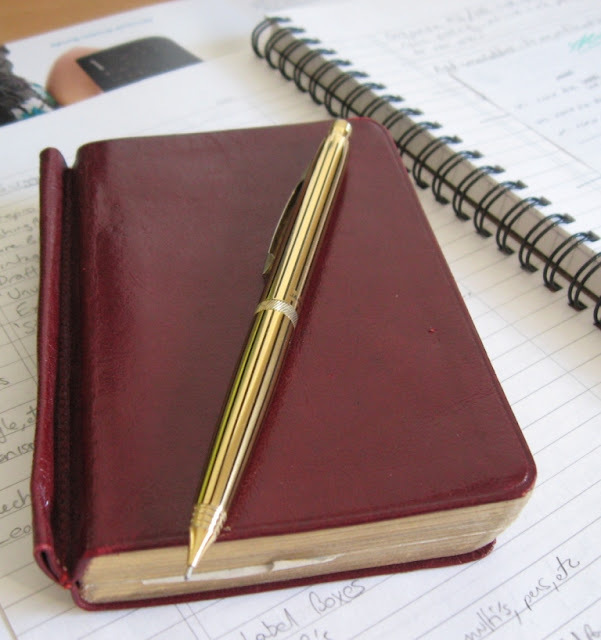 However I did definitely feel that Nano Dia B felt smoother when writing than did Nano Dia HB. I did not feel there was any real difference in smoothness between Ain and Nano Dia. OK, well now we have the final two tests. Personally I feel strength is the single most important characteristic of a thin lead, and by clicking out a short length and pressing slowly down on paper to break it, I believe the strength of these two leads is close, but there was a clear winner, and it was not Uni Nano Dia. So, I believe Pentel Ain remains the undefeated champion of strength. 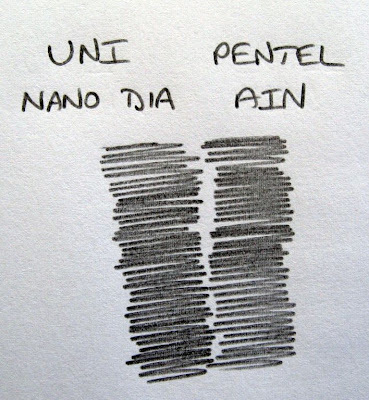 Uni do claim that the Nano Dia formulation results in a low wear lead, i.e. 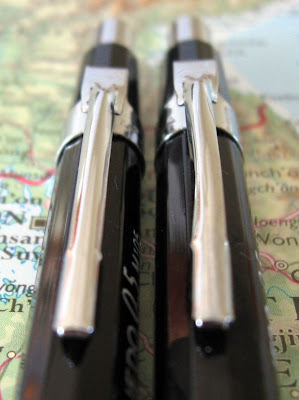 you get to write more letters per stick of lead. So, that’s my last test. I clicked out a length of lead and drew ruled lines, as you can see. 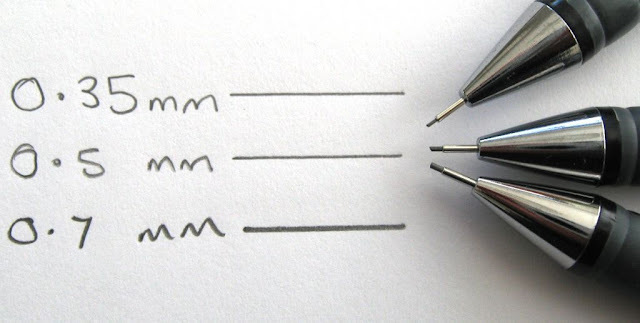 First with Nano Dia, then with Ain, repeat over and over, each time counting how many lines I could draw before the lead wore down and I hit the sleeve. Clearly this was a very subjective test as there was almost a 100% difference between the number of lines with the same brand of lead. One time I drew only 15 lines, another time 30, both with the same brand of lead. My procedure was to do the tests in pairs - I would draw a set of lines with one lead, swap pencils and draw another set with the other brand of lead. Now, here’s the thing, despite the huge variability, Uni Nano Dia never won a single match. Every pair of sets of lines was won by Pentel Ain. Sure, sometimes it was close, and sometimes it was a thrashing, but Nano Dia never won once. As subjective and imprecise as my test was I think the result was clear. So, where does this leave me? 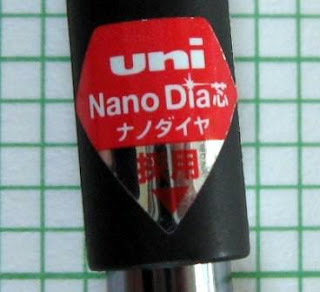 Uni Nano Dia is clearly a good high quality lead, exactly what one would expect from a respectable Japanese brand, but I don’t think the hype matches the result and I will still be loading my mechanical pencils with Pentel Ain. I have read on some repuatble "Blogger Issues" sites that there are quite a few well known common problems with Blooger and comments. It appears that if you have the problem then many viewers will not be able to comment on blogs that use embedded comments like I do, and that others will have problems with the CAPTCHA letters not displaying for comment verification. So, leave a comment if you have problems commenting on this blog. Yeah, right. Anyway, if this problem is affecting this blog please let me know by emailing me at the contact address on my Blogger profile. Thanks. Not sure if I have mentuioned it before, but I am now uploading most images in high resolution so chances are you can click on an image to view it enlarged in higher resolution should you so wish. 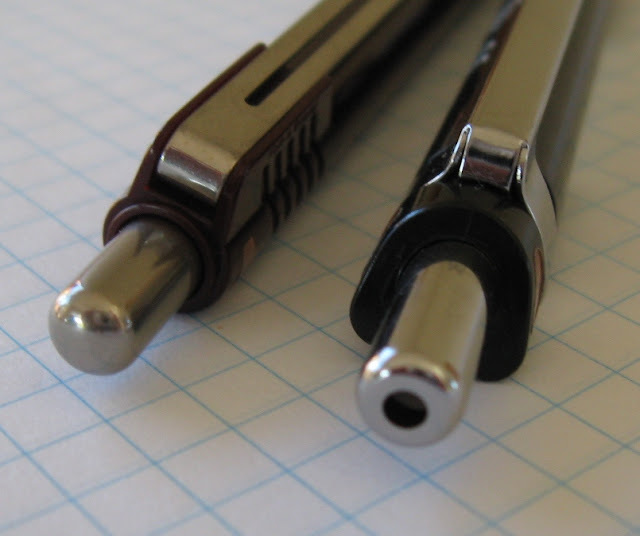 What to do about the sharp pointy end of the mechanical pencil? 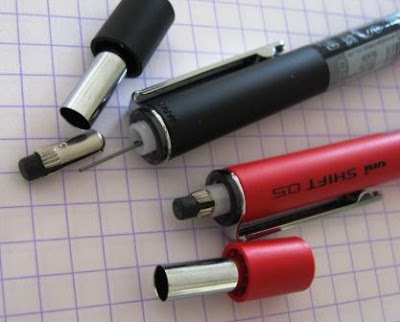 That’s a problem that has long exercised the minds of the designers and users of mechanical pencils. Many just ignore it and have a fixed sharp tip. 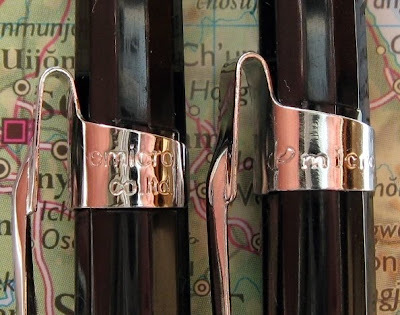 Others protect the sharp end by having sliding retractable lead sleeves, or caps, or double action vanishing points, or extendable protective over-sleeves, or…well the list goes on. 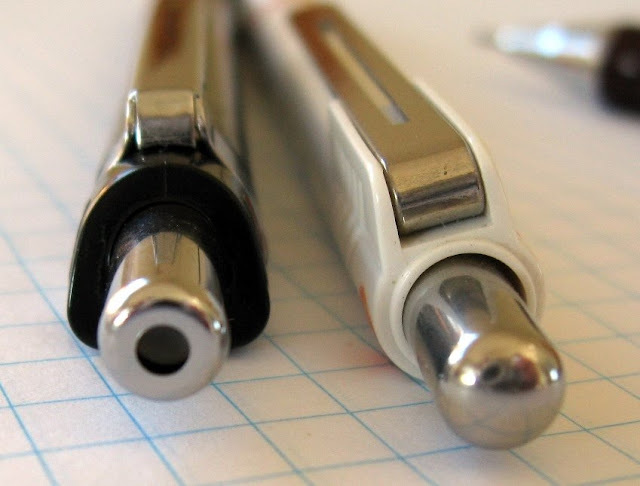 The subject of this review, Mitsubishi Pencil Co’s Uni Shift 1010 mechanical pencil uses something akin to a vanishing point mechanism to protect the lead sleeve when it is not in use. When retracted (storage or carry mode), the Uni Shift looks like this. When extended or in writing mode it looks like. The change is brought about by pushing the upper body section forward which in turn pushes the lead sleeve out of the fixed front section. Note the change in overall length of body above the grip, and the position of components, but there is only a minute change in total overall length. At the top and bottom of the body sections travel you twist it just a few degrees to lock it into position. When in carry mode, the push top button does not operate so you cannot accidently advance any lead. The lead sleeve is retracted back in carry mode, but it’s tip is only just inside the front section, and if you had recently advanced the lead then it can be left protruding out the end of the front section. This is not a major problem, but it does mean it can potentially mark the inside of whatever you put your Shift into, and to be honest, I am slightly disappointed Uni didn’t eliminate this matter by having the sleeve retract just a fraction further back. It doesn’t take long to get used to the idea of pushing the body section up or down to advance or retract the tip, but the little twist to lock it into position is slightly problematic. Whilst it is a fairly definite and positive action, it is possible to only half-twist, particularly when advancing the tip. This locks the tip in the writing position, but not securely, and a little later you can inadvertently have it unlock and spring back into carry mode whilst you idly move the pencil about in your hands when not actually writing. I accept that this matter is within the control of the pencil user, and it’s only a minor point, but I am again slightly disappointed that Uni somehow didn’t address this in the design phase. 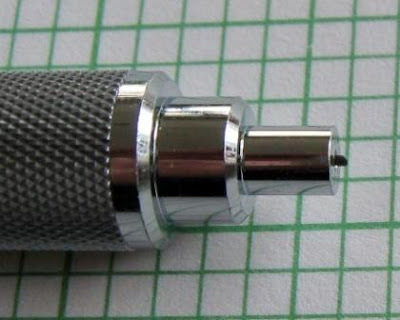 The lead sleeve is a 4mm long thin pipe suitable for drafting work. I do note that the Uni Japanese website generally emphasises drafting pencils for precise writing of characters, rather than for any traditional drafting work. Although the sleeve is retractable it is not a sliding sleeve. So, when extended it is fixed in position and does not slide back up inside as the lead wears down. Having said that, it isn’t a fixed sleeve in the traditional sense and there is a very small amount of wobble, which ultra precise type users who demand rock-solid instruments will not find acceptable. Of course the actual sliding upper body section also has some wobble on the central shaft, but that shouldn’t really concern anyone. The lead advance mechanism is a standard push top ratchet. As mentioned above it only functions when the pencil is in writing mode. Ten clicks of the mechanism will get you 6mm of the 0.5mm lead. The Shift is available in other lead diameters. 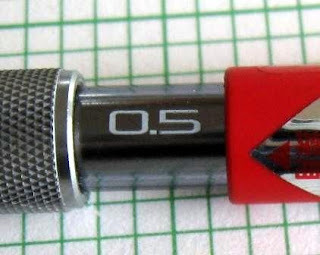 As well as the black and red 0.5mm M5-1010 models shown in most pictures in this review, I also have the 0.7mm model, i.e. M7-1010, as below. It looks rather nice in silver and orange. There is a small eraser under the top cap. Black. Very cool. You pull the eraser out to access the lead refill magazine. The pocket clip is a rather plain but springy and functional chromed metal. The grip is a diamond cut metal section. It doesn’t feel too abrasive on your skin and provides a good secure grip. It is a round grip, and straight sided, so you can hold anywhere and twirl as much as you like. Weighing in at about 19g the Uni Shift is a medium weight mechanical pencil and it is balanced towards the tip. The weight, balance and looks all combine to make the Shift look and feel pretty good in the hand. 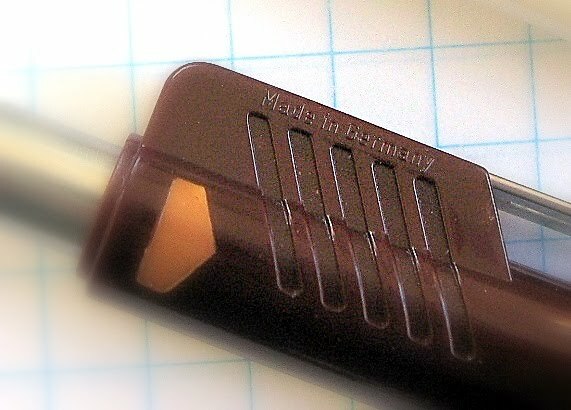 Markings on the pencil are “Uni Shift” and the lead size on the upper body section. 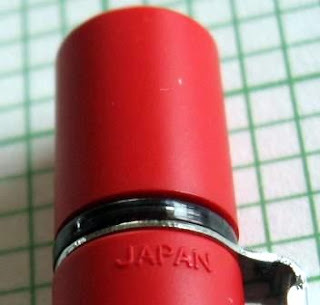 “Japan” is also moulded in small letters on the upper body section. The lead diameter is also marked on the central body core and visible when in carry mode. Note the sticker advertising this mechanical pencil is factory loaded with Uni Nano Dia leads. 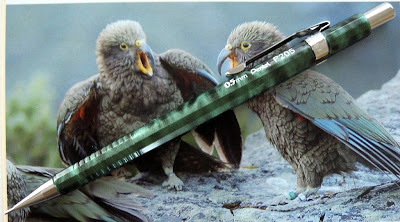 Overall then the Uni Shift is a very nice mechanical pencil and worth having in a collection. Best Points – The Shift mechanism makes an interesting change. Not So Good Points – Not properly locking the mechanism. 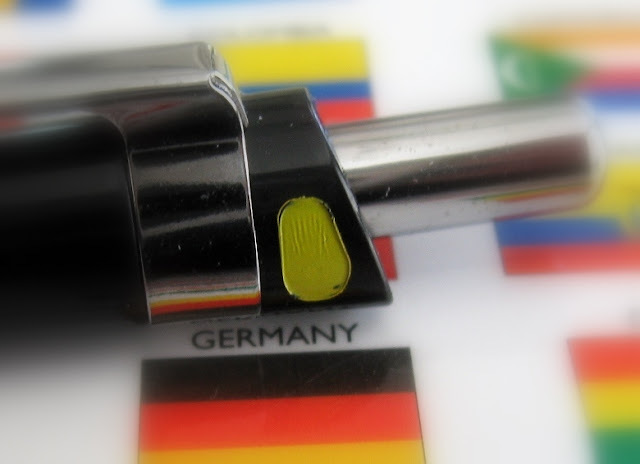 Dimensions – Length 143mm, diameter 9mm. Balance point about 60mm up from the tip.